Yes, now not only will Jessica Simpson be able to sing in tune, she’ll be able to be tuned to an Indonesian pelog scale! 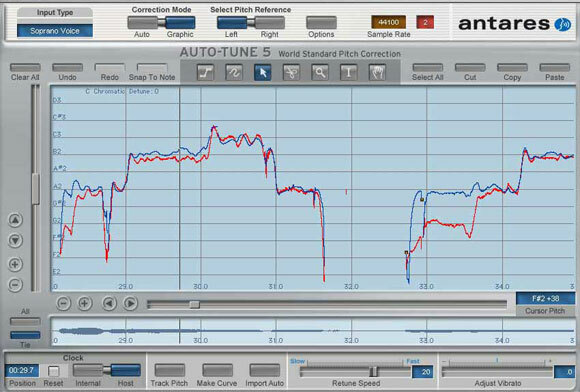 AutoTune, the ubiquitous and now pretty ridiculously powerful tuning software, has some major new improvements in AutoTune 5. Central to the upgrade is a graphical mode that lets you draw pitch envelopes over a representation of the detected pitch. Here’s where things start to get interesting: the developers at AutoTune have added pen tablet input, so you can hook up your Wacom tablet, polish off your drawing skills, and perform either subtle tweaks or expressive, experimental pitch changes to an audio source. Microtonal and alternative guru Carl Lumma, a veteran of Keyboard Magazine, writes to point out that the upgrade now no longer limits you to conventional major and minor modes: 26 historical and microtonal scales are included in the new release. That’s great, but they don’t seem to support Scala tuning files, which would be even better. There’s also new sync-to-host support, so you could do some crazy beat-synced pitch distortion with this. It’s too bad AutoTune isn’t a little more affordable, because it sounds like just the kind of software a lot of us would love to abuse. The adjustment speed and vibrato controls are all designed to be expressive and closely controlled, so I think there’s likely a wide range of sonic effects you could coax out of this very powerful software. Go find a friend with a plug-in-laden Pro Tools setup and ask if you can borrow it late at night.